Home›Movie Reviews›Dudes - Cult Classic With Jon Cryer and Flea Finally Gets Reissued! 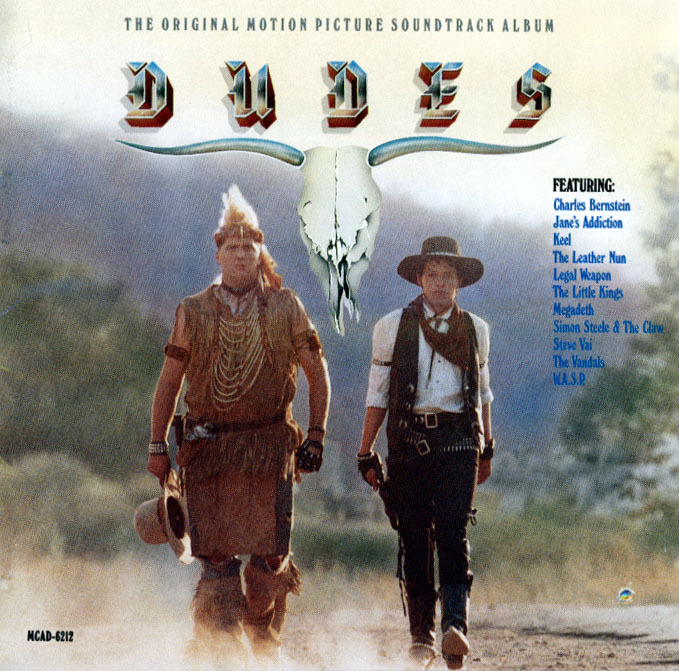 Dudes is directed by Penelope Spheeris (The Decline of Western Civilization, Wayne’s World) and stars Jon Cryer, Flea, Lee Ving, Catherine Mary Stewart, and Daniel Roebuck. In Dudes, three punk rocker buddies from New York, growing disenfranchised with their day-to-day lives, decide to pack it up and head out to live in California, starting over in an exciting new place. Unfortunately, things do not go as expected. The trio runs afoul of a redneck gang, who in turn murders one of them during a robbery. The two remaining friends, with the help of a friendly tow truck driver, a bullfighting Elvis impersonator, and supernatural visions of cowboys and Indians, set out to seek revenge on their fallen friend. Leave it to the good people at Shout! Factory to give the movie the reissue that it was long overdue for. 30+ years after the movie’s original release, this is the first time it has been given any sort of wide issue! Shout! Factory has been putting out many niche titles for the past decade plus, and it is great to see them showing some love to an obscure gem like this that may never otherwise have seen the light of day on a modern video format. 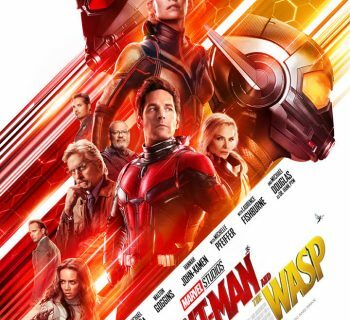 It has been stated that part of the reason Dudes never got the distribution or the recognition that it deserves is the fact that it is simply too hard to place the movie in a single film genre. It’s a comedy. It’s a drama. It’s a revenge picture. It’s a road movie. It’s a Western. It’s a supernatural thriller. It’s a fish-out-of-water story. Sure, you’ve seen these kinds of movies before, but when is the last time you found one movie that crams all these elements together? If I had to choose a single classification for Dudes, I would probably go with “Comedy/Drama,” but even that does not describe it completely accurately. These days, everyone knows Jon Cryer for his longtime role of chiropractor Alan Harper on Two and a Half Men. But his performance in Dudes is an early high point, letting him show off a wide range. You’ll laugh with him, you’ll cry with him, and he’ll win you over in his role as punk rocker Grant. 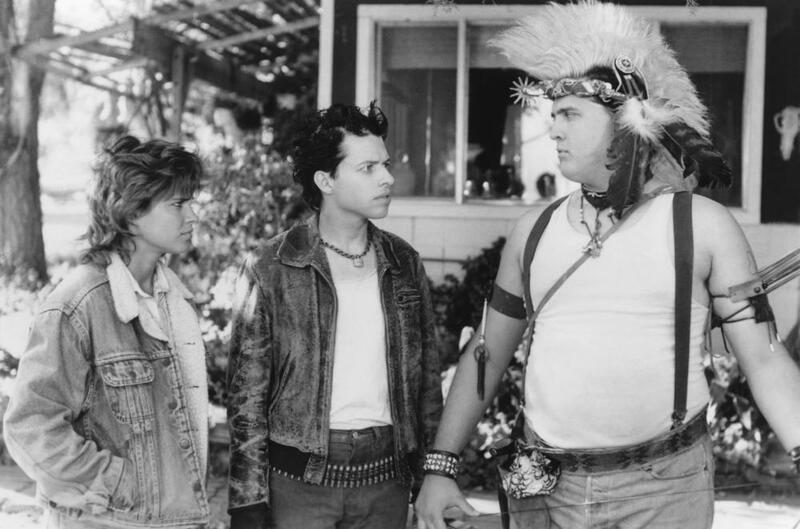 His chemistry with co-star Daniel Roebuck, and eventual relationship with Catherine Mary Stewart’s Western-style love interest, and in his quest to get revenge on the redneck gang leader portrayed by Lee Ving, responsible for their friend’s murder, are definite highlights here. Red Hot Chili Peppers bassist Flea (long before that band broke into the mainstream) has a brief but memorable role as the friend killed early on in the film, sparking the revenge quest. Hell, we even get a brief cameo from Doors drummer John Densmore as a police officer near the end of the film! One of the best aspects of the film is that many aspects feel realistic and relatable. Cryer and Roebuck’s characters look like stereotypical punk degenerates, and people who see them in small old-fashioned towns react accordingly. They are written off by local law enforcement when trying to file a police report, and get their asses kicked by rednecks in a bar. Yes, the film goes over-the-top on more than a few occasions; what other movie combines punk rockers with cowboy and Indian spirits, and a bullfighting Elvis impersonator? The relationships, rivalries, and revenge quests in the film all feel believable, yet the movie still never strays far from a comedic element. The film’s soundtrack features a strong variety of rock and roll of the era, including songs by artists like Keel (covering Rose Tattoo! 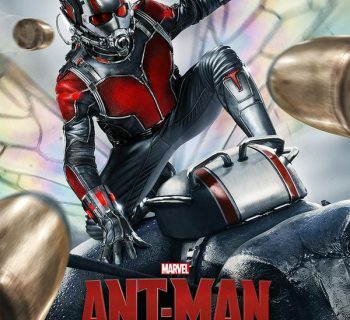 ), WASP, Faster Pussycat, Megadeth, The Vandals (who actually appear in a cameo early in the film), Steve Vai, and Jane’s Addiction. Penelope Spheeris has always been an underrated director, particularly in terms of her pre-mainstream Hollywood pictures. This is a genuine example of that; she understands the rock and roll subcultures, how people actually act and react in situations, and above all, how to make a movie like this. The pacing is just right, and although a few sections here and there drag or feel rushed, overall this is a fantastic movie that ranks amongst one of her most fun films to watch, even if mainstream recognition has largely passed it by. 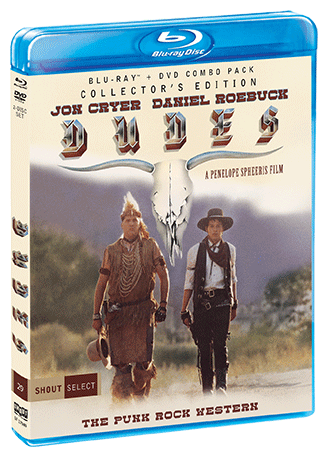 There is nothing else quite like Dudes, which may have been a contributing factor to its lack of proper distribution and release in the past, but doesn’t that just make a cult classic like this something you are all the more eager to check out? It is claimed that the film has been restored and remastered. Title sequences and some effects shots (which are limited) show heavy grain spiking and are not in the best of shape, but throughout the film, things look very good overall. Some scenes, particularly outdoor daytime scenes, show a surprisingly strong amount of detail on Shout! Factory’s Blu-ray Disc. There is some age-related wear in a few moments of the movie, but overall, it looks very good; I can’t imagine the movie looking any better than it does here, and this fan is fine with that. The audio fares well, whether we are hearing dialogue, gunshots, or something from the all-star soundtrack. In this case, due to the obscurity of the title, there is no readily available VHS or DVD release to compare this Blu-ray to. Shout! Factory has impressed me with their “Shout! Selects” line in terms of the bonus features they bring to the table. For this release, we get nearly two hours worth of brand new interviews with Spheeris, Cryer, Flea, Stewart, Roebuck, and screenwriter Randall Johnson and producer Miguel Tejada-Flores. Also included are a vintage “making of” featurette, a photo gallery, and a theatrical trailer. 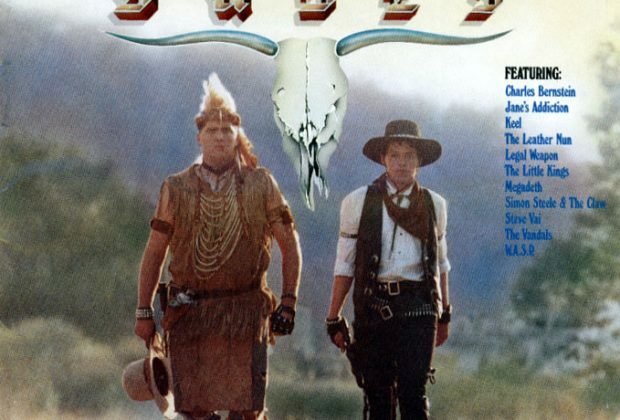 My one complaint in regards to the bonus features is that the music video for Keel’s cover of “Rock and Roll Outlaw,” which incorporates footage from the film, was not included (likely for legal reasons or being unable to find/get said video). Dudes is a one-of-a-kind cinematic experience, and Shout! Factory has finally given it a proper mainstream release on a modern format! The film is an underrated classic, and while not Oscar material by any means, you’re sure to find something to love about it. The brand new bonus features, over two hours worth, are the icing on the cake. A strongly recommended package! 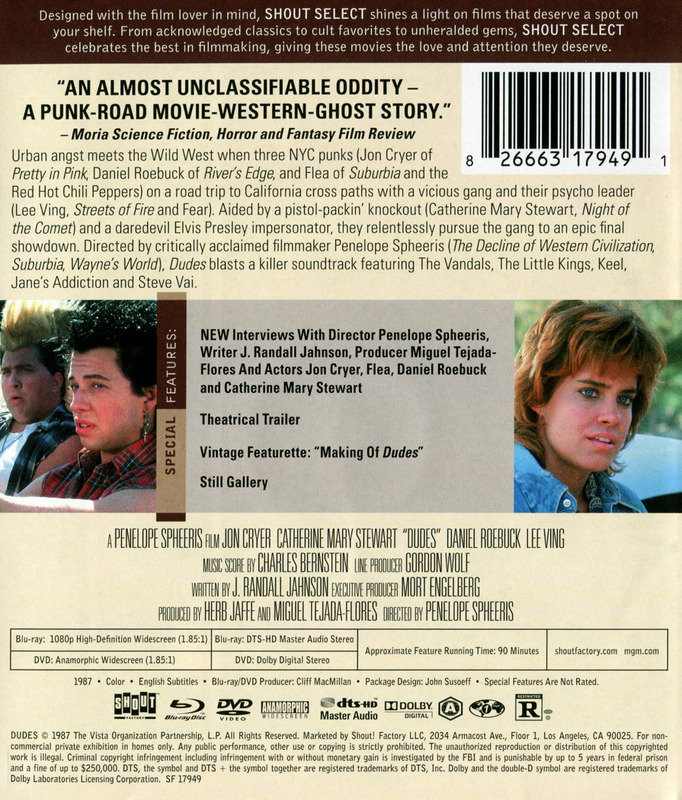 DISCLAIMER: All images in this review are the property of the respective copyright holders, including Penelope Spheeris, Spheeris Films, and Shout! Factory. For promotional use only. All rights reserved.